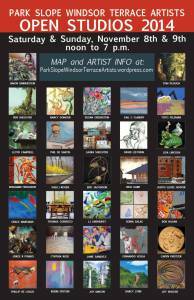 Over 30 artists in 20 locations. 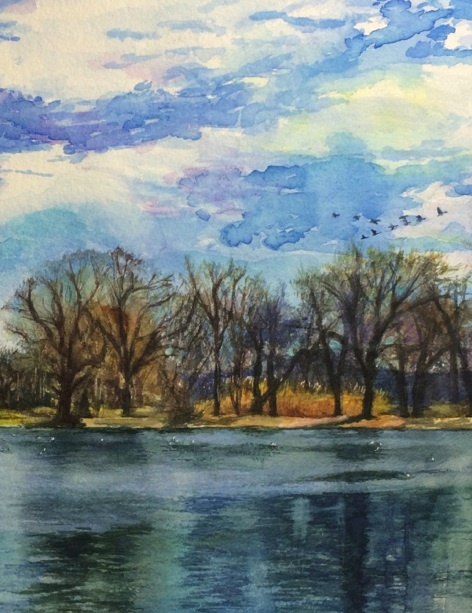 Shown, watercolor by Joy Makon, letter O on map. THE FERVOR OF POLITICAL ENGAGEMENT since the 2016 election, notably — but not only — the global women’s marches on the day after President Trump’s inauguration, has startled commentators and politicians alike, and heartened some. But this should be no surprise, for protests are a solid part of the American experience. More than a hundred years ago, this American poet celebrated the fact that here “speech, thank God, no vested power…can gag or throttle.” Ella Wheeler Wilcox also complained of “the lawlessness of wealth-protecting laws.” Read on for more of her only-too-timely views. Ella Wheeler Wilcox was born on November 5, 1850, at Johnstown Center, Wisconsin. She was widely read in her time, and Brooklyn Artisan recently reprinted a New Year’s poem of hers. Her books include Poems of Passion (1883) and Poems of Peace (1906). This poem was published in a collection in 1914, and may have appeared earlier in a periodical. Ms. Wilcox died on October 30, 1919, the year before the 19th Amendment was ratified, giving women’s voting rights protection under the Constitution. Windsor Terrace artist Susan Greenstein’s watercolor view from New York’s High Line (not for sale). THIS WEEKEND (NOVEMBER 12-13) THIRTY-FIVE ARTISTS in Windsor Terrace and Park Slope will open their homes and studios and invite us in on Saturday and Sunday to have a look, talk about art or not, and maybe buy something, maybe not. The hours are 12 to 5 pm both days. Brooklyn Artisan is quick to attest on the basis of previous years that it’s a lot of fun to do and certainly should give you a good rest from politics. The site also has a Directory of Artists that’s set up to be fun to browse. Use it as a planning tool to choose studios most likely to interest you. In past years, Brooklyn Artisan has started our meanderings at the southeastern edge, 41 Fuller Place, with the dazzling watercolors of Joy Makon. Many of her subjects are local scenes, beautifully composed (and hard to resist. Ask Joy about giclée prints, too). One year we worked north and west to Park Slope, ending up with interesting conversation on technique in Simon Dinnerstein‘s impressive top-floor home studio (his Fulbright Triptych is world famous), and another year, we circled around Windsor Terrace, buying a charming Christmas book with illustrations by Dara Oshin and a watercolor by Susan Greenstein for Christmas gifts. 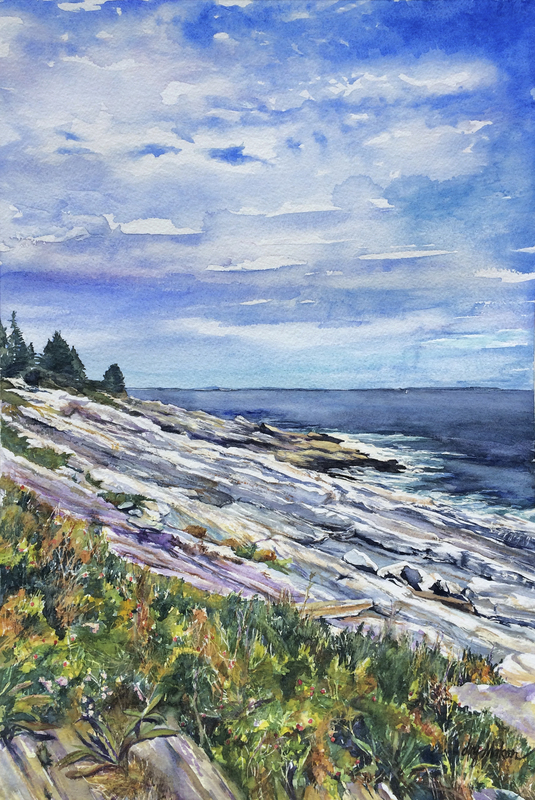 Facing East at Pemaquid Point, watercolor by Brooklyn Artisan executive editor Joy Makon. At letter R on the weekend open studio tour. Weather reports forecast a beautiful late-fall weekend, November 7 & 8—a perfect time to wander about Park Slope and Windsor Terrace and pop in and out of the 34 artist studios that will be open for viewing this weekend. 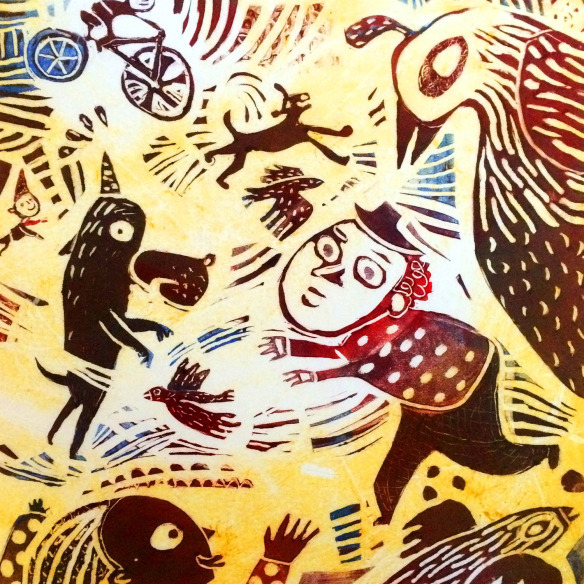 The third annual Park Slope Windsor Terrace Artists Open Studio Tour features a mix of cutting-edge, classic and experimental work from established and emerging artists who make Brownstone Brooklyn their home. Many of the artists on the tour recently participated in Gowanus Open Studios and if you had a chance to discover art there, you’ll be pleased to find a lot more this weekend. Look for the green balloons outside of each open studio location. FREE. NORTH SLOPE studios: painters Gregory Frux and Janet Morgan, letter I on the map; distinguished classical artist Simon Dinnerstein, letter F on the map, mixed-media painter Jerry Friedman, letter H on the map. SOUTH SLOPE studios: metal-sculptor Janet Goldner, letter Y, will be doing welding demos over the weekend; David Weiner, also at letter Y, will create event-based sculpture in real time; abstract painter Joy Walker, letter X; printmaker, illustrator, painter Nancy Doniger and kinetic metal sculptor Eric Jacobson, showing at letter G; digital/photo/social commentary artist Bob Hagan, letter M; plus 9 additional open studios—check the map. WINDSOR TERRACE studios: sculptor Lisa Lincoln, letter P, will be creating with clay on Sunday; functional potter Caryn Kreitzer, letter O; at letter E: monoprints, watercolors by Susan Greenstein plus watercolors, photography by Phil DeSantis, plus 4 additional open studios—check the map. SO SAYS INFORMATIONWEEK. In the 2015 InformationWeek “Elite 100” listings of top business-technology innovators, the Brooklyn Public Library not only makes the list – the only library to do so – but it’s no. 25, rubbing shoulders in the top quarter with UPS and FedEx, NASA, Boeing, Biogen, PayPal, TIAA-CREF and Merck. Why? “As a result of our partnership with Tableau,” says the library’s President and CEO Linda Johnson, “BPL’s 60 branches are more responsive than ever to the needs of the communities they serve.” The library’s eResources – meaning eBooks and eVideos, catalog info, even homework help – serve Brooklyn’s 2.5 million residents 24/7 at www.bklynlibrary.org. See ya’ at the libe — online. Want To Start Your Own Artisanal Business? MORE THAN A NOVELTY, three-dimensional printing pioneered here in Brooklyn by MakerBot and some other companies around the globe is making its mark on the world. Here’s a seasonally heart-warming tale that tells why. A Scott Terpin donut. His website has many, many more. Yum. IN THE SINGULAR ECOSYSTEM that is Kickstarter, one will encounter many evolutionary dead ends—projects, visions and dreams that wither away unfunded. Then there are the mysterious campaigns that don’t just meet their targets, they blow by them and reach double, triple or stratospherically higher funding results. Why and how do these hyperachievers succeed, and can we learn any lessons by studying their success? Here’s one that caught our eye at Brooklyn Artisan. Scott Teplin was creating his massive, quirky and highly detailed drawing called Big Canal and asked Kickstarter support for a hefty $4,500 to complete it. On the face of it, Scott is like many an artist—with a pen, a brush and a dream. But by the end of the campaign, his project was overfunded 11 times, garnering more than $49,000, which is a goodly chunk of the annual salary for a Brooklyn artist. Big Canal is one of those drawings with lots of quirky details that demand hours to explore—Where’s Waldo? without the people, Richard Scarry without the cute animals. What is the secret of its funding phenomenon? The campaign video stars Scott and, though mildly amusing, won’t win a Palme d’or. Maybe it’s the many photos on his Kickstarter page that engage the viewer in the overall process. Or it could be his suggestive marketing that positions the reward as a great poster for a kid’s room. Or maybe it just appealed to the random whim or previously undetected want of the Kickstarter audience. One thing is certain: The man can sure draw donuts. ANDREJ UREM IS BUILDING CANDLES THAT ARE DEFINITELY IN A NEW MOLD. Straying far from the traditional cylinder shape, they explore form and texture in intriguing directions—creating what the artist terms “livable art pieces.” His Kickstarter campaign seeks funds for a 3-D printer that will enable him to create more precise and complex molds for future designs. Backers are rewarded with their choice from his current line of candles. WINDSOR TERRACE WAS OUR STARTING POINT yesterday, the first weekend day of the Open Studios event. (From Manhattan, take the F train to 15th Street and follow the map from the OS website.) Walk down Fuller Place, one of the most nearly perfect blocks in the area, with its contiguous front porches, to #41 where you’ll meet watercolor artist Joy Makon, who speaks interestingly and unpretentiously about her work and technique. After a long and successful career as a magazine, online and book cover designer, and columnist for Brooklyn Artisan, last year Makon began to bloom as a painter as well. Some of her pieces are for sale (several were snapped up yesterday), and for a few, excellent giclée print reproductions can be bought at very reasonable prices. ALTOGETHER A SPECIAL AFTERNOON of visual adventures, good art talk, and a house tour as well! You can retrace our steps today or make your own itinerary from among the many more studios open today. GROWING UP IN A SMALL KANSAS TOWN, I wanted to learn to play an instrument because all the smart kids knew how to play an instrument. My parents ignored me, but they let me get a car instead. I really didn’t do anything about the whole music thing until one Saturday morning here in the big city when I walked into a music store in midtown Manhattan and bought the cheapest guitar possible (“You can pay more,” a college friend said, “but you can’t pay less”) and toted it back to my apartment. Then I sat on my couch and stared at it for a while and realized I might’ve made a mistake since I didn’t have a clue how to play it, but I refused to accept that idea. That’s when I found Park-Slope-based Winslow Browning on the internet. We talked and he asked me what style I wanted to learn—Rock? Classical? Country? Um, Easy Listening? Gee, I hadn’t thought about that. “I like the Beatles?” I said, except it did sound more like a question. TWO DAYS LATER HE SHOWED UP AT MY APARTMENT at the appointed hour with his guitar, which looked to me like the most beautiful instrument this side of Spain. He examined my guitar critically, then he showed me how to sit properly, how to hold it, and how to play the notes of a scale — you know, Every Good Boy Does Fine. He showed me flats and sharps. Then he told me to pick up a music stand and First Lessons for Guitar (Las Primeras Lecciones de Guitarra) by Julio Sagreras. We never spoke of Rock, Country, Easy Listening or The Beatles again, but he did do his best to teach me how to play Spanish classical guitar. Browning went on to study music with renowned classical guitarists Fred Nance and Juan Mercadal, the latter a Cuban master. “I was so totally steeped in the classic music field and so hungry to reel that all in and take all these classical classes, all this pop music stuff got tossed out on the other side,” he told me. SO THAT’S WHAT HAPPENED TO MY LEARNING TO PLAY “DAY TRIPPER” AND “I FEEL FINE.” I wouldn’t say I was an abject, miserable failure at classical guitar (although the pieces Winslow did manage to teach me sounded nothing like they did when he played them) because he taught me how to play scales and tune it and change strings when I had to. And I can still do all that stuff when forced to at knifepoint. He also taught me that it was a good thing my parents didn’t waste money on music lessons for me and let me waste it on a car instead. But in his hands even my cheapo axe sounded beautiful. IT’S A GREAT THING THAT WINSLOW’S STILL AT IT, sometimes giving lessons in his five-floor walkup, or anywhere around the city really — he comes to you. Also, he and his wife, accomplished flautist Suzanne Gilchrest, present a limited concert series with their group Guitar Among Others. Like Paul McCartney’s later career, or Steely Dan’s, GAO’s lineup always changes. And each summer they travel to Summerkeys, a summer camp for classical musicians in Lubec, Maine, where he’s the only guitarist who teaches solo playing. “In the Brooklyn Eagle a few years ago there was an article that talked about how Brooklyn was made up of a bunch of small towns and villages,” he says. 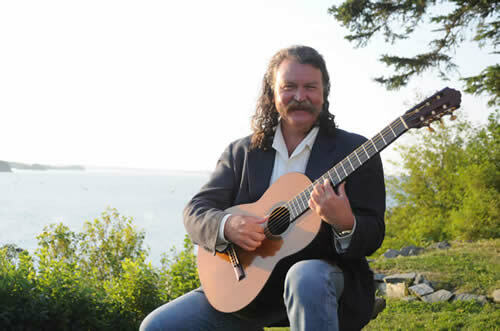 “I love telling the story in Lubec because it really is a small town; it’s very comfortable, and you’ll walk up the street and someone will say ‘Hey, that was a great concert last night.’” No wonder they say that to him: Like I said, the guy really knows how to play a mean Spanish classical guitar. Today, Executive Editor Phil Scott plays a mean keyboard — of the qwerty sort — and as you can read for yourself here he also knows how to twirl a dial. As Ample Hills Creamery oft reminds us, Walt Whitman wrote admiringly about our Kings County homeland. The words below, however, are Whitman speaking of the country as a whole and what makes “America’s choosing day” so quintessentially American: “the swordless conflict” to be resolved at the ballot box. 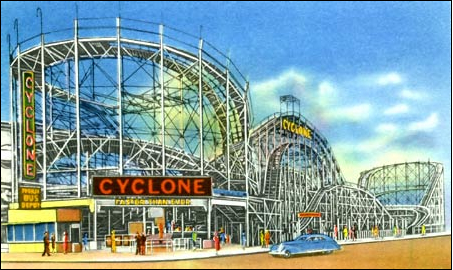 A small footnote: 1884 is the year that Coney Island started building its roller coasters, a perhaps-too-perfect political symbol. Getting ready to hang a lot of paintings for next weekend’s Park Slope Windsor Terrace Artists Open Studio Tour. Hope you can stop by! Saturday November 8 and Sunday November 9 from noon to 7pm each day. Full information, including a map listing the two dozen participating artists, is on the group’s website. “I’VE ALIGNED MYSELF WITH STUCKISM FOR TWO YEARS,” says Judith Mills, on Open Studio day at Industry City late last month. “It has really helped me,” she says, with emphasis. With your art?, Brooklyn Artisan asks. “Yes. It enabled me to narrow down my focus to the realistic—what’s real, you know—and then to pull out to the expressive.” She gestures energetically toward the wide range of large canvases around her, wonderful, colorful, magnetic, different from one another — all that and more —and to Brooklyn Artisan, not remotely realistic. It is titled “THE STUCKISTS,” referring to a quote from Tracey Emin: “Your paintings are stuck, you are stuck! Stuck! Stuck! Stuck!” The subtitle of the manifesto is “Against conceptualism, hedonism and the cult of the ego-artist.” The manifesto dates from April 8, 1999, and is signed by Billy Childish and Charles Thomson. (“First published by The Hangman Bureau of Enquiry,” it says at the bottom, and gives an English address, in Kent.) It advocates authenticity in one’s work, one’s art, one’s life and one’s self. Judith Mills is one of the artist-organizers of Open Studios at Industry City, the complex of lofts and warehouses at Bush Terminal, in Sunset Park, Brooklyn. About 75 studios belonging to artists, photographers, stained-glass craftsmen, jewelers, musicians, and textile designers,were open to visitors. And The Stuckists? Per Wikipedia: “Tracey Emin, CBE, RA (born 3 July 1963) is an English artist. She is part of the group known as Britartists or YBAs (Young British Artists),” and then it details a number of Bad Girl behaviors (such as being “drunk and swearing” on live TV), but not as many, apparently, as Tracey herself has revealed. For instance, in 1997 Emin showed Everyone I Have Ever Slept With 1963–1995, a tent appliquéd with quite a list of names, at the Royal Academy in London. More lately she was appointed of the Order of the British Empire, and is one of only two female professors—ever—at the Royal Academy since it was founded in 1768. Functioning in such a culture might make anyone behave like a Bad Girl. Megan Grissett, who lives in Sunset Park, saw a notice of the Open Studios event posted in a neighborhood cafe and was eager to come over. A graduate of Savannah College of Art and Design, Megan came to New York from Raleigh, North Carolina, about three years ago. “I live up the street,” she explains, and says she ‘d always wondered about Industry City. As we sit and chat on one of wooden benches in a hallway on the fourth floor of Building B, Megan glances down at a fresh tattoo on the top of her right foot. Rendered in green and red, it is the image of a long-stemmed budding rose. “I just had it done,” she confides, “in memory of my grandmother, who died about a month ago. I’ll think of her every time I look at it. See Brooklyn Artisan’s prior stories on Industry City Open Studios. More coverage of artists and their studios will be posted this week. Anne Mollegen Smith also writes personal finance articles for investopedia.com. The artist Dylan Vanderhoeck, with “Gibsonia,” a 2013 work. “I CAN SEE THROUGH MY HANDS’ is what the young artist Dylan Vandenhoeck called the work he was showing Saturday in his @SO WHAT SPACE in Industry City Building B, where he has space B424 (that signifies his room on the 4th floor of Building B in the huge complex that formerly was the Bush Terminal in Sunset Park, Brooklyn). Yesterday was Industry City’s first Open Studios day. Organized cooperatively between Industry City and some of its creative tenants, the event was an invitation to interested visitors to “get a rare glimpse of works in progress, and discover how each tenant has customized a raw studio space to fit his or her medium and personal style,” its brochure said. Two contrasting images form a single piece, the real and the after image. “Gibsonia” is based on a real place remembered, Dylan explained to Brooklyn Artisan. It was done in oil on canvas. The contrast is exaggerated between the dark room and the soft rug with vibrating colors, and the brilliant scene beyond the window sill’s plants. In “Palm at the End of the Mind/After Image,” right, a newer work in oil on linen, which appears to be two pieces joined into one, the contrast is as though you stared at the bright palm fronds on the left and then closed your eyes, seeing the after image on your retina and in your mind. That concept sets a theme for the whole day’s happy experience of wandering from studio to studio, seeing work in progress and talking with the artists, photographers, designers and artisans practicing their craft. Over coming days, Brooklyn Artisan will report on more studios we visited. Former editor-in-chief of Working Woman magazine and the Art of Simple Living, Anne Mollegen Smith also writes about personal finance for investopedia.com. Seen outside of Poppy at 217 Fifth Avenue in Park Slope. (Brooklyn Artisan Photo Pool). FURNITURE TAKES THE STAGE at The Factory Floor in Industry City in Sunset Park. The ground-floor venue is a former industrial space newly converted to showcase local design work. Sponsored by Industry City, the Brooklyn Chamber of Commerce, The Pratt Center for Community Development and the Brooklyn Navy Yard, The Factory Floor is presenting primarily Brooklyn furniture makers, designers and builders. Last weekend’s show coincided with the Sunday opening of the Coming Together: Surviving Sandy art exhibit in the adjacent building. If you are interested in the art and craft of design, this is the weekend to make it out to 241 37th Street, Sunset Park, Saturday and Sunday, 10am to 6pm. Bring the kids, Construction Kids has set aside an area where they can build their own objets d’art. Annie Evelyn at New Colony Furniture takes hard materials and makes soft seats. Really. Diverse objects, from seats and shelves to vases and trivets at Souda’s space. Funny and quirky pillow commentary from Alexandra Ferguson. 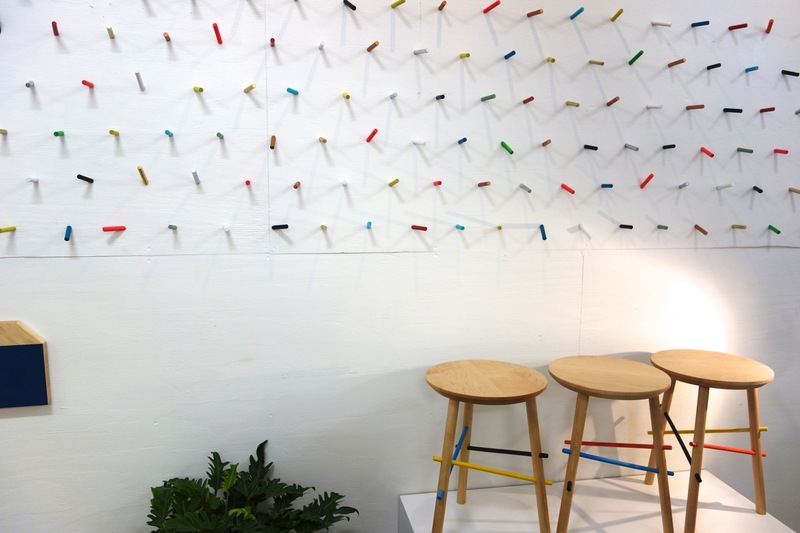 Beautiful maple stools and a passel of refrigerator magnets made from the leftover bits by Bower. Apparently that WAS the wolf at the door, and someone let him in. Several blogs and the New York Observer have reported that following a brief frenzy of fundraising that most thought was just crying “wolf,” 3rd Ward has shut down abruptly. Members who have based their businesses there must scramble to get their inventory and gear and find new locations on the shortest of notice. Industry City, anyone? UPDATE: In an email yesterday, 3rd Ward notified members that they must remove their stuff by day’s end October 11, and there will be no membership refunds. Gothamist reports: “Even 3rd Ward’s instructors were kept in the dark, many armed with lesson plans they’ll never use—and compensation they’re worried they’ll never see.” Nigel Shamash, an agent for the building itself, not 3rd Ward, is also scrambling to provide spaces for ousted 3rd Ward members. Naturally there’s a website: SAVE3RDWARD.com. It is intended for the community, not for the 3rd Ward sponsors or administration, as businesses using the site figure out what to do. Some would like to retain studio space in the building, at least in the short term. OF COURSE THE WEATHER TURNED FREAKISHLY WARM a few days after this sign was put out by Fleishers, the artisanal butcher on Fifth Avenue in Park Slope that specializes in grass fed, organic meats. But a timely menu suggestion has been made. Dust off the trusty stew pot or set out to acquire one, for chilly days will soon be here. WHAT COLOR WAS BOGEY’S FEDORA? Tough question. Brown? Gray? I’ve always envisioned Humphrey Bogart wearing a brown fedora in any of his fedora-wearing good-guy movies like Casablanca. The movie was released in black-and-white, but in the scandalously colorized version from the ‘80s his suit is muddy brown, Ingrid Bergman’s silky dress is muddy yellow, and so is Bogey’s pocket square. The characters’ faces are muddy pink. Except Sam, the piano player. So that’s no help. If anyone knows, it would be the Goorin Bros.
Goorin Bros. is pronounced like Gorn, that sluggish green lizard man that Captain Kirk battles to the death in Star Trek, the original series. The Brooklyn store at 195 Fifth Avenue isn’t like the team cap wall at your local Modell’s sporting goods, or the cheapo hat pile at the open-air bodega up the avenue, the place where you can buy an emergency stocking cap or a cheapo stingy-brim Justin Timberlake knockoff fedora resting in a pile on a folding table, all colors and patterns, in all sizes from small, medium, large, and X-large. This is a real hat shop, with expansive plate-glass windows with Goorin Bros. Est. 1895 in gold-leaf lettering, and shelves inside brimming (Get it? Brimming?) with hats. Though the store has just opened for the day, it’s already brimming (Again! Hah!) with customers. In front, helping a couple, assistant shopkeeper Nicky Culter, wears a Homestead Grays baseball cap sideways while showing a customer straw boaters, perfect for the summer season. In back, near the cash register, shopkeeper Alex Mroz finishes ringing up three others. He wears a Mahi Mahi, a light brown straw fedora that goes with his sharp suit. ”Why do you keep your hat on indoors?” I ask him straight off. It’s an insulting question, but my dad used to slap my head when I wore my baseball cap at the dinner table. “This is a hat store. People expect it,” Mroz says. “Or I just tell people I’m religious.” After all, Goorin Bros. does carry black fedoras for the Hasidic set. While baseball caps are always fashionable, felt hats began dying off in the late 60s as men grew their hair longer and stopped slathering it with Brylcreem. But lately real hats have begun a resurgence. You see bowlers, fedoras, even the occasional boater on the streets of Brooklyn or in the subways or buses. Like everything, you want to point to television; personally, I attribute it to Mad Men. And Justin Timberlake. I tell him that I’m looking for a brown Bogey fedora, vintage Casablanca or The Big Sleep. He says they don’t have any in brown, but offers a gray fedora, the type Bogey wears when he plays the villain, like The Roaring Twenties. I try one on, but I need a double-breasted suit and a gat (that’s 30’s gangster-speak for a revolver) to pull it off. Mroz thinks I might be interested in something with a narrower brim, a “stingy brim” measuring between an inch and an inch and three-quarters. After all, they have a wide selection. Again, I think Timberlake. “You can just imagine Sinatra wearing one, hanging at the Sands with Dino and Sammy,” he says. “Sinatra is one of our hat heroes.” And no doubt: There’s a picture of Sinatra, with a feather stuck in his hat band. Which reminds Mroz: “We have a Feather Bar, where you can customize you hat to make a unique statement,” he says. You get this guy talking about hats and there’s no stopping him. “This is a genuine panama hat, woven in Ecuador,” he turns to the display on a middle table and searches for my size and fits it on my head. Nah. I’m not the cigar smoking type. I discover a stack on the shelf. “Now this looks like one Buster Keaton wore in his movies,” I say. “It’s called The Buster. Keaton used to make his own hats.” Talk about small-batch artisanal. Except for the band, The Buster is barely discernable from the one Harold Lloyd wore while hanging off a clock in Safety Last. “It’s a classic men’s summer hat—men wore them with the bands in their school colors,” he explains. And there’s a framed photo of a crowd of young men, apparently well dressed college men, though all you can really see is the tops of their straw boaters. Goorin’s is not just about men’s hats: There are women’s in all shapes and sizes, the types that gals would wear in the Easter Parade on the Avenue, Fifth Avenue, when a photographer would snap them and they’d find themselves in the rotogravure. There are cloches and pillboxes, though nothing outrageously weird that Princesses Eugenie and Beatrice wore to Wills and Kate’s wedding. Mroz shows me one last hat, a dark, wide-brimmed porkpie. “In Breaking Bad, Walter White wears one to be intimidating when he’s trying to collect money,” he says. I put it on and just look goofy. “You have to wear it with gusto,” he says. No matter whether I have gusto or not, the prices are pretty reasonable. The lowest is $21, and handmades start at $79. Handmade? That’s why I ordered a handcrafted brown fedora, just like Bogey wore in Casablanca. It’ll probably go great with my blue jeans, running shoes, and my Steely Dan t-shirt. Executive Editor Phil Scott is the author of seven books and numerous magazine articles on travel, aviation, science, humor and brain health. He is teaching a journalism class at John Jay High School in Brooklyn. Chalking the World and a Stilton Cheese? TODAY WAS LAUNCH DAY FOR THE NEW BARCLAYS CENTER GREENMARKET, in cooperation with GrowNYC. The market’s regular hours are 8 am to 4 pm on Wednesdays now through November. (Food stamps are accepted, even incentivized, at GrowNYC partner-markets.) Brooklyn Artisan braved today’s extreme heat to browse the farmstands and talk with the vendors, but didn’t stick it out for the mid-morning food demonstration of corn salads. The giant rodent sits at the corner next to the greenmarket. John D. Madura Farms had the biggest spread, from corn to carrots to kale plus potatoes (see photos above), radishes, and plenty more, grown at Pine Island in the Black Dirt Region of Orange County, NY. Staffing the booth was John D.’s young son Skuyler, who spoke with pride of the community-supported agriculture part of the family business. Need goodies for a morning staff meeting? Ah, ask James. Matt was our guide to Applestate’s pure honey varietals. Matt in the Applestate Hilltop Family Farm booth knows his bees, or at least their honeys, the way a vintner knows grapes. He was ready to share his expertise — the sweetest honey came from the clover-fed bees, he said, whereas the wild-flower nourished bees produced a more nuanced flavor. The pure-honey complexities are interesting. (As he talked, Brooklyn Artisan imagined friends-and-family brunches built around honey-tastings.) The Applestate Hilltop aviary is in Calicoon, Sullivan County, NY. Of course, it wouldn’t be Brooklyn artisanal without pickles! Rick’s Picks of Dutchess County has been producing hand-packed and all natural pickles “since 2004” and today was pushing Rick’s Picks’ Hotties – referring not to the smiling gentlemen in the booth, but to their crenelated cucumber and julienned veggies bottled with special hot (“but not searingly so,” one New York Times writer judged) pickling spices. Rick’s Picks pickles come in sweet flavors (4 choices), savory (6 choices), spicy (3 — hotties, mean beans, and smokras) and several special proprietary blends. Gift packs can be ordered from Rick’s Pics and you can even get low-sodium pickles from them. Rick’s Picks’ artisanal pickle vendors sport shirts that don’t permit taking themselves too seriously. GrowNYC’s handy credit-card sized fold-out of greenmarkets and farm produce outlets that take EBT credit lists nearly 50 in the Heartland (Brooklyn), and another 100 in Outer Brooklyn locations. Photographs: Brooklyn Artisan Photo Pool. One might quibble about how “objective” the pep talk is, but the Bill Jones motivational posters have clear messages. OFF MY MIND AND ONTO MY DESKTOP: One can relish the relief of listing tasks to be done tomorrow in order to stop worrying about them tonight. Whether it’s on a piece of paper, in a file on the computer, or on a whiteboard in the corner, it’s good to leave the list at work when the day’s over. If it’s in an app on a mobile, best not to check it until tomorrow. Off my desk and onto yours: Delegating has at least two forms. One is giving away the task and putting it completely out of mind, knowing the results will be apparent without further effort on your part. The other is assigning the task and expecting to follow up to be sure it gets done, to praise or nudge or redirect. In the second case, the task hasn’t really been given away, it’s just been transformed from one kind of task to another. Off my list and out of my mind: It’s worth remembering that one form of prioritizing is not letting a task get onto one’s personal to-do list in the first place. If the list has gotten too long anyway, then decide which things not to do. Let go of them, at least for now. That keeps the list from being overwhelming. REMOVE THE DOUBT — THAT’S ANOTHER WAY OF SAYING HEADS MUST ROLL when certain types of screw-ups occur. So after the IRS’s targeting of Tea Party groups to search out 501 (c) 4 violations made such big news, the acting head of the agency had his “resignation asked for and accepted.” Could he have survived in the job if he’d broken the findings to the President himself simultaneously with firing the hands-on people involved? Maybe. And maybe even if he couldn’t get out in front of the news, but had acted quickly to remove those most responsible. That’s what Hillary Clinton and her management cadre at the State Department did after the tragic news from Benghazi broke; when she “accepted responsibility” for inadequate security at the Benghazi post, it was clear she was speaking in code — it happened in her agency and she was handling it: The faulty decision-makers were already on the way out the door . We’re still waiting to see what the fallout will be after what looks like excessive phone monitoring of the AP in an effort to find the recent big leaker. Even more, we’re still waiting for Wall Street and banking to “accept responsibility” and clean up after the financial crisis, the “liar’s loan” mortgage mess and the wrongly foreclosed housing. In a small-business context, when a client’s order has been screwed up, it’s up to you to ‘fess up, clean up, sometimes even pay up, and show what action you’re taking to be sure it never happens again. A change of employees, a new procedure, or taking over that dawn delivery route yourself — whatever will “remove the doubt.” That’s a business fundamental. Bill Jones to Jeffrey Krusinki: What were you thinking (with)? As has widely been reported, less than two weeks ago Lt. Col. Jeffrey Krusinski, head of the Air Force’s Sexual Assault Prevention and Response program, was arrested and charged for allegedly sexually assaulting a woman in a suburban parking lot in Virginia. The fictional Bill Jones was the voice of career advice in the 1920s and 30s posters put out by a British printing company. Though the advice here was meant in another context, it’s not hard to imagine what Bill Jones would have thought about sexual assault or harassment, or derailing one’s career in this way.